While looking at the comic page in my local newspaper the other day, this frame from Sally Forth really caught my eye...The mom was reminiscing with her daughter about old times and began to cry...thus leading up to the last frame of the comic. I found this an especially poignant way to describe that emotion of remembering those special times in one's past. While babysitting the grandkids last week (was it only last week?!?! ), I couldn't help but think about the fact that as young parents we sometimes get so caught up in the "taking care of" duties...that we aren't able to really enjoy the wonderment of our children. I know that this occurred with me as a young mother raising my two boys. Maybe that is why being a grandparent is so incredibly fascinating and delightful...We are finally at that point where the responsibilities are trumped by being able to truly just enjoy the children being children. We have handed the parental torch down to our kids and it is now up to them to bring their children up the best way that they can. Now, it is Grammie's time to just enjoy them and spoil them as best that I can. As tired as I was last night, I couldn't stop thinking about the two of you and the wonderful days that we all had together. Owen, the "Greemies" were amazed by your sharp mind and your incredible memory. If we mentioned that you could have some hot cocoa and marshmallows the next day....YOU remembered the minute that the next day started. You didn't forget a thing!! Your mastery over words never ceased to surprise us...especially your rhyming skills...you loved doing that over and over again! Sometimes you would say something that seemed way beyond your two years and 5 months on this earth. Mimi and I would just smile as we both claimed which side of the family that intellect came from...ha ha. Audrey, Audrey....what can I say about you? First of all, you love, love, love to eat! Not only do you enjoy the food going into your mouth...but, you enjoy smushing it around your high chair tray...getting it into those chubby little fingers of yours and then rubbing it in your hair--on your face, etc. etc. Then, you would look up at us with those gorgeous blue eyes of yours, crinkle up your nose and give us the biggest smile! Covered in oatmeal or applesauce or peas or sweet potatoes--- your grin just melted our hearts. You are such a happy and content baby...and, you seem to have gotten used to your big brothers enthusiasm and noise level. You can sit up and play on your own for quite a while as you explore the world around you. And, when you giggle....oh, be still my heart. You are trying so hard to crawl forward and the Greemies think that you are just days away from a full-fledged crawl. Right now you can crawl backwards, sit up, and then crawl backwards again...but, as soon as you can get your "gear" out of "reverse"...watch out! You are going to be a force to be reckoned with! Mimi and I were amazed as we watched you kick those adorable pudgy (thunder thighs!) legs of yours back and forth with unrestrained joy! Your arms would flail all around and the legs would begin to go...and go...and go....When I held you on my lap, you loved to stand up with my help and just do knee bends over and over again. Such enthusiasm, zest, and strength. Thank your Mommy and Daddy for entrusting us with their most precious possessions...the two of you. Well, here we are....our last day together. What a mixture of emotions! As Mimi and I opened a bottle of much needed wine tonight, we toasted the fact that we had made it through our fourth day of "The Great Babysitting Adventure"! We put puzzles together, played with race cars (vroom, vroom), got "examined" by Dr. Owen and his doctor kit, changed diapers, diapers and more diapers (! ), wiped runny noses, sang songs, danced, built towers with Leggos, soaked Cheerio's in warm water and cut the soggy things in half for Audrey to "gum", helped Owen make pizza for dinner and continually cleaned up shredded mozzarella cheese that was from one end of the kitchen to the other, laughed until we thought that we would explode, burped, took a million few pictures, hugged, did laundry, made up bottles of formula, cleaned out the bottles after the feedings, gave baths, "rubbed, kissed and blew" on boo boos to make them better... ETC. ETC. ETC. ...and, tomorrow we get to do it all over again! Well, the "Screaming Greemies" have now finished day three of the "Great Babysitting Adventure" and are still barely alive and kicking. OK. Truth be told, we are exhausted. Happy, delighted, loving every minute of it.....but nonetheless-exhausted. I know what you are all saying: "That is why one has babies when they are young"...and, you are right.....it's the absolute truth! Yesterday was spent at an incredible indoor park. There are quite a few of these in MN since the winters are so harsh. The first room was a huge gymnasium filled with toddlers running, gliding, rolling, throwing balls, jumping, squealing with delight....etc. etc. The minute we got there Owen was off and running. It was pure heaven to him having all of this free space that was actually heated and toasty. The next section was filled with all kinds of climbing apparatus, sliding boards of all types....as well as little "games" to play with spinning tiles, etc. It was pretty frenetic in there, so, of course Grammie climbed up the rope ladder (!!) to follow behind Owen to make sure that he was okay. Once up at the top I realized that I could not get my body any higher than a crawl as this whole contraption was geared toward little people. I kept saying to myself (and anyone else who would listen), "I am too old for this! "...But, it was such a joy to watch Owen having a great time...so I stayed with it. Mimi was in charge of waiting and watching from down below as he came down the slide time and time again. She got some great pictures that I will post when I return home for a good laugh. I received a call at 3:30 a.m. from Delta airlines telling me that my 6:45 a.m. flight was going to be moved to 7:45...but, I still needed to be at the airport by 5:45. HUH? Well, I arrived when I was supposed to....we boarded at around 7:50....and then sat on the plane for a couple of hours without taking off! It seems that the weather in Atlanta...(my first stop) was bad and things were backed up. After the first hour of being "held captive" on the plane.... I looked into my carry-on bag and noted that I had several dozen homemade oatmeal cookies that I had baked the night before to take to the kids. Realizing that everyone was probably getting hungry (and irritated!) at this point...I made the decision to walk up and down the aisle and give out my cookies. People seemed surprised at first..but really appreciated this gesture...so, that was good (Delta airlines owes me big time!!). Of course, I would have to make another batch of cookies upon my arrival into MN...but, that was okay. Move ahead to today.....all is well....we have survived our first day with the two grandkids. We decided to put Audrey into daycare....and keep Owen with us. Between the feeding and the changing and the organizing...it took us quite a while to get going (we wondered how our kids did all of this AND went to work full time! )...but, we finally got on the road and the day began! Mimi and I looked at each other......sighed......and realized at that very moment that no matter how exhausting this was going to be.....it was the start of an absolutely wonderful experience that we will treasure forever. Coming to collect hugs tomorrow!!! I have been talking about it for so long now that I can't believe that it is finally here! "The Screaming Greemies" (Grammie and Mimi combined) will be together again-- babysitting Owen and Audrey for a week while Mommy and Daddy head to warmer climates and some R and R...(a belated celebration of their 10 year Anniversary). The "Greemies" are ready to SPOIL, SPOIL, SPOIL take care of Owen and Audrey. As we settled in to watch "Desperate Housewives" last night, suddenly the tv went dark. "Has the world come to an end?" we wondered. Since I 'bundle' my services with Charter, this also meant that my phone stopped working and the Internet was shut down. What is a person to do?!?! He worked on this for quite a while...hooking these contraptions up....trying different positions with the antenna, etc..... until he was finally able to get a very fuzzy black and white picture on the bedroom tv. The sound went in and out as did the blurry picture....especially if you walked by the tv. The whole process made me realize the reality of being addicted to television. I decided to get some other things done...so, I began to gather clothing together for my trip Wednesday. I actually got most of my packing done! I realized just how much I could accomplish without the distractions of the tv, phone, and computer. It was amazing. It made me really grasp how much time I spend watching tv, talking on the phone, and browsing the Internet. I have to admit. I kind of liked it....especially, the quiet. Part of my Valentine's treat was another delicious dinner cooked by my own personal Chef Dave. The wine was opened and allowed to breathe while he began to do his magic in the kitchen. As always, I was ordered to 'stay out' of the kitchen...I didn't mind one bit as I sat and took in all of the yummy odors coming from his cooking.. The dinner consisted of a lobster tail with warmed drawn butter for dipping, Shrimp and Crab Gratin (a heavenly combination of lump crab meat, artichokes, spinach and cheeses), sauteed fresh mushrooms, and a combination of tomato, onion and asparagus. It was divine and I savored every bite. For dessert I had made a red velvet cake in the shape of a heart with an M & M message on top of the icing. Mmmm. I am looking forward to enjoying all of the leftovers for dinner tonight! Part two of my gift was a "Pampering Package" from one of the local spas. It includes aroma steam therapy, one hour full body massage, hot oil manicure and a pedicure. All I can say is "Aaaaahhhhhh..."
I am thinking that a visit to the spa may be just what I will need after a week of chasing around babysitting energetic 2+ yr. old Owen and feeding, diapering, etc. taking care of sweet little Audrey!... : ) . "Love is a force that connects us to every strand of the universe, an unconditional state that characterizes human nature, a form of knowledge that is always there for us if only we can open ourselves to it." Today is Friday, the 13th.....Thirteen is my lucky number since it is the date of my birth....so, I don't get too worried when it falls on a Friday like today. Do you? In preparation for my trip next week, I have been checking out the temperatures in Minneapolis. I noticed that the high is going to be 26 degrees and the low, 8 degrees tomorrow....Valentine's Day. I hope that everyone living there has their love to keep them warm. So Tatianna will be in the top 36 on American Idol...what were they thinking? She is a little scary, don't you think? Maybe it is a ratings strategy? There were several finalists that I didn't necessarily agree with...and some got cut that I thought were great. At one point I even found myself "yelling" at the judges:"Are you crazy??" ...but, then I realized that I was talking to a television. 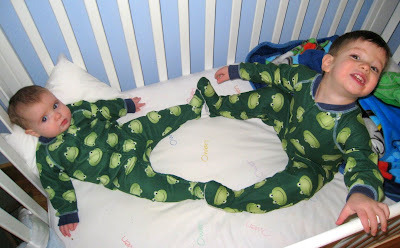 I sent in pictures of my three grandbabies to the "Beautiful Baby Contest" on Regis and Kelly. They have many of the candidates photos on their site...and, you know what? They are all beautiful. That's the wonderful thing about children...there's not an unattractive one in the world. They all have those sweet faces and innocent eyes. Maybe it is just the "grandma" in me...but that is how I feel. I was thinking today about how much "maintenance" I have to do as a 60 yr. old woman. Moisturizing, waxing, hair dyeing, fingernail and toenail polishing, teeth whitening, plucking, hair rolling, vitamin taking, healthy eating, sloughing, exercising...etc. etc. I have a plethora of day creams, night creams, body creams, eye creams, wrinkle creams, hand lotions and other assorted potions. The new Survivor started last night. As soon as they arrived, each team had to vote one person off. Of course, one group immediately voted off the oldest member....a woman about my age. But, she showed them....while they were all hiking to their campsite in 100+ temperatures, the Show did a surprise turn and transported her by helicopter way ahead of the rest of the team....dropping her off at the site to await their arrival. Just goes to show you that older can also be wiser. Let the packing begin! I continue to check on the week ahead in MN so that I will know what to put into the suitcase. When I arrive on Wednesday they are predicting snow showers and temps in the teens. I am rounding up anything and everything that has any warmth to it and throwing it in...(Owen's elephant should be nice and warm all nestled in there!) : ) I do need to remember that warm clothing can be heavy....and, Delta has a 50 pound limit on the one allowed (free) suitcase. There's going to be an elephant in my suitcase when I leave for Minneapolis next Wednesday. It seems that I had great intentions during my most recent Skype (webcam) episode with Owen, my 2 yrs. 4+ month old grandson. I thought that it would be cute (and educational?) to ask him what he thought Grammie should pack in her suitcase next week before flying to see him. My expectation was that we could discuss all of the things that one needs for a trip....especially a trip to the tundra, glacial, freezing cold little bit chilly city in Minnesota where my kids live. Scarves, hats, gloves, jackets....as well as the necessities like toothpaste, shampoo, etc. etc. My elementary education degree was starting to show as I began my "lesson" with my grandson. "Ummmm," he pondered my question for a while. With a huge grin on his face he finally answered; "An elephant!!!". I could tell that he was quite proud of his clever answer. "An elephant, huh!?!" I said. Hoping to catch him a little offguard, I continued; "A big one?" He laughed and replied, "No, a little one!". AlrightythenwhathaveIdone?.....I thought to myself. I guess that Grammie needs to go and find an elephant to pack into the suitcase for next week. That sounds easy, doesn't it? Well, trying to find an inexpensive and packable elephant turned out to be quite a challenge. Three toy stores later, I finally found my elephant. I can't wait to laugh with Owen when Grammie takes it out of the suitcase to surprise him! "Healthified" Zucchini Bread...here I go again! While visiting my son Jeffrey's family in December, his wife, Janet, made the most delicious zucchini bread that I have ever tasted!! It was moist and flavorful....rich, yet not too heavy. Dave and I enjoyed every last crumb of it while there. She is such a wonderful cook, so I wasn't surprised at how yummy it was. Upon leaving, I asked Janet for this wonderful recipe so that I could make it at home. I received that recipe via email yesterday and now realize why it was so scrumptious! It is filled with yummy things such as grated zucchini, cinnamon, vanilla extract, walnuts...eggs, oil and lots (2 and 1/4 cups) of sugar! This put me in a quandary of sorts. Do I make her incredible zucchini bread...or do I try to ruin it "healthify" it? I have attempted this before with banana bread as well as pumpkin bread and ended up with two, very heavy banana and pumpkin "bricks". But, as I have felt my pants getting a bit tighter around the waist lately (groan) and, as I am watching high cholesterol numbers, I decided to attempt a lighter version...hoping that it might come out better than the two previous attempts. I went to this wonderful site called "Eat Better America" to see if there was a healthier version of zucchini bread that I could try. There was....so, I made it. It is only 180 calories a slice and loaded with dietary fiber provided by using a whole wheat flour and white flour mixture....and, the applesauce replaces half of the oil which keeps the fat content down. Now, to me, this counts as my eating a serving of vegetables. Don't you agree? Zucchini is a green vegetable, isn't it? As I got ready to go to the dentist this morning for my final two permanent crowns to be put on, I had some anxiety. Going to the dentist doesn't bother me, but one of the two molars that had a temporary crown on it had been throbbing causing me some discomfort the past few days. My dentist was leaving this afternoon to go out of the country...and, I will be leaving a week from tomorrow until the 26th...so, I wasn't sure what he would decide to do. I was concerned that it was going to need a root canal...in which case he would have to leave the temporary crowns on until my return in two weeks....not to mention the extra expense of my already costly dental work! Sitting in the chair all novacained up, I heard the following: "These are not her crowns!". Uh-oh...this is not starting out well. After much investigating, it turns out that the lab had delivered my crowns to the wrong dentist...so, me and my numbing mouth had to sit and wait until the delivery could be made. Well, at least the dental assistant had a good laugh over it all. During the placement of the permanent crowns, the dentist was testing my bite to make sure that everything was lined up correctly. He would do the "chop, chop, chop,....slide, slide, slide" with the carbon type paper in between my teeth to see where the teeth were hitting. He would then occasionally ask me how the bite felt. Being numb on one side, it was difficult to answer this, but, I gave him the best answers that I could. Several minutes later, he again did the "chop, chop, slide, slide" command....stopped, looked at me and said, "Talk to me." Not quite understanding why he wanted me to talk to him I said: "Hellllloooo". He and the assistant burst into hysterics. He was wanting to know if the bite felt good. I thought that he was just being friendly. What did I know? The dental work had to be temporarily paused as we all laughed so hard that we had tears in our eyes. How many times does one leave the dentist's office laughing? "This attitude of cheerful optimism, of seeing everything in an attractive, pleasant light, has always been with us. The expression itself goes back to at least 1861, when it is first recorded in 'Tom Brown at Oxford': 'Oxford was a sort of Utopia to the Captain.He continued to behold towers, and quadrangles, and chapels, through rose-colored glasses." From the "Encyclopedia of Word and Phrase Origins" by Robert Hendrickson (Facts on File, New York, 1997)"
Ironically, while down in Florida last week, I came home with the above pair of rose-colored glasses from my sister's "Pink Party" that was held in honor of her breast cancer walk supporters. While the glasses were strictly a fun item from the party...it did make me think about how I do see the world around me....and questioned whether this was a good or unrealistic way to go through life. Benjamin Cardozo once said: "We are what we believe we are." and Buddha said: "All that we are is the result of what we have thought. The mind is everything. What we think, we become. "I fully agree with these simplistic statements and think that it has kept me basically optimistic about my life. I like to think the best of people. I am most comfortable when I see joy and happiness in others...and have been "accused" of "trying to make the world happy" (tough job). I believe that everyone is basically good...but that goodness sometimes gets buried through years of sadness, anger, hurt, etc. etc. Some people are kept 'down' by this, and some are able to rise above it. I have seen self-fulfilling prophesies become real when people have a positive outlook. There is so much power in looking for the best and seeing that mental and emotional idea can become our reality. Call me naive, but I sincerely believe that what we are...and, what we project to others...comes right back to us in time. We may not be aware of it at first, but with patience, our kindness gets mirrored and does, in fact, reflect back. Like others, I have had some challenges in my life. I certainly have my moments when I am down and saddened by things. But, for the most part, I have not let these things change the person that I am inside and how I view my world. So, is this seeing the world through rose-colored glasses? Am I avoiding reality while believing in fantasy? I love a project that allows me to be creative! While visiting a friend after her recent surgery, I loved the knotted fleece blanket that someone had made her. I spent a huge chunk of time trying to pick out the perfect fleece pattern for each of my granddaughters...finally settling on a ladybug print for Audrey and a Nursery Rhyme pattern for Celia. Both of them would be matched with this very soft pink fabric. If you've never heard of these no-sew blankets...they are basically two pieces of fleece (or other soft material) laid back to back....one inch wide fringe is cut all around...and then knotted. Pretty easy....and absolutely beautiful and fun when finished! Here are some pictures of the finished products with a bit of the pink underside showing in some. Dave walked in with a bouquet of twelve beautiful, red roses last night. "They are gorgeous" I said, "but, honey, Valentine's Day isn't until next Saturday." "I know" he said, "but, since you are leaving town a week from Wednesday...I wanted you to be able to enjoy them for more than three days." I'm trying to ignore the fact that I really need to gather together all of my paperwork to prepare for income tax time. I dislike that I have to do most of the work, hand it all over to my accountant.... and then he gets paid! OH, I abhor that chore and always put it off for as long as I can. Unfortunately, it will still have to get done whether I ignore it or not....but, you can't blame a girl for trying. Have any of you done yours yet??? A little story from Mom and "The Home" today. She was toasting some bread in her toaster oven when she started to smell that it was getting a little burnt. Suddenly her smoke alarm went off..and, she said that it was excruciatingly loud and she couldn't shut it off. She grabbed the piece of toast...threw it into the sink and doused it with water....the alarm continued to wail. Shortly thereafter, her personal "help me" alarm started going off, too. She was able to get that off...and then called the office to get some assistance. Soon, two employees were up in her room opening up the sliding doors and the one window that goes to the outside. "Are you alright?" they quickly asked as they were rushing around. "I'm fine," Mom said, embarrassed with all of the fuss...."I was just trying to make a piece of toast." The alarm finally shut off and all was well...but, she later saw one of the custodians from "The Home" who said to her: "I hear that you were trying to burn the place down today..."
"I tried," she teasingly answered, "but it didn't work." It is an absolutely beautiful day here in Birmingham...mild temperatures...and plentiful sunshine. It makes me wonder why I am sitting here inside of the house typing on my computer.... when I could be outside enjoying it all. All of that smiling wore me out! Little did I know that when Dave and I left last night to see the Broadway Series show, Ain't Misbehavin', that it would be such an "exciting" night. The show brought several American Idol stars with it...including Birmingham's own Ruben Studdard who won the title in 2003. Two ther A.I. alums, Frenchie Davis and Trenyce Cobbins were also in this production. While the show started out a bit slow, things really picked up by the second half! The voices were strong and the harmonies were fabulous...and they got "the joint a'jumpin' " before too long. As we left the theater, I turned my cell phone back on only to find out that I had missed two calls. The first message was from my alarm people letting me know that my alarm had gone off. The second message was from my neighbor who let me know that several policemen were called to the scene and had walked through the entire house looking for any evidence of a break in. The good news was that they did not find any problems and that it was a false alarm.......the bad news was that it took them 30 minutes to respond to the call. That was not good to hear....and, a phone call was made to the Sergeant this morning to make them aware of the situation. He promised me that they would look into it and find out why there was such a long delay. Then he would have "his people call my people". Save the "Ta-tas" / Save the Planet! So, Karen and Sherri decided to go "green" this year with their potties. Every piece on the door is made entirely of recycled materials! Even the 'ta-tas' sitting at the top of the cardboard breast cancer ribbon symbol/body! Make sure that you read the first word very carefully! Ya gotta love a sense of humor! 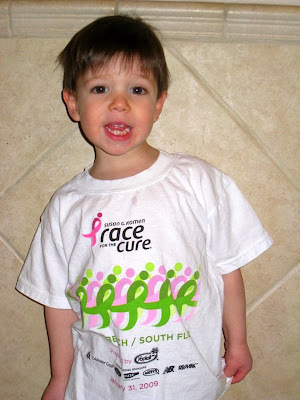 I am still processing the emotions that I felt as I walked with family and friends in the S. Florida Race for the Cure. The honored "Warriors in Pink" including my incredible sister, Karen, up on the stage after leading the hundreds of survivors to the front...amid cheers and tears from their loved ones watching them bravely marching in hopes of finding a cure for their disease. It was a whirlwind of emotions for me. I felt unbelievable joy as I watched my 'baby' sister celebrating her nine years of being a breast cancer survivor. She was diagnosed at age 39...and, now, she stood tall---and, cancer free---at the age of 48. Looking through the crowd, there were occasional signs of the disease in these beautiful faces....some with newly lost hair as a result of their chemotherapy treatments...some frail and weak and needing help in making the walk....but, they all marched in a way that blended them all together with a new-found strength and purpose. Their spirit and determination were palpable and their courage inspiring. Watching them made me rethink my priorities a bit. Common complaints became just that ---"common". These brave women were fighting a real life and death battle. Because of this walk and so many others that go on all over the world...many of these women have beat this disease. Because of the donations that have funded breast cancer research, many of these women have survived and thrived. My little contribution began to feel huge to me as I realized that every bit helps in this cause...and, I was so proud to be a small part of this huge effort. I wish that all diseases could receive this kind of impressive support...if not in my lifetime...then at least in the lifetime of my children and grandchildren. Please think about that the next time that you receive an envelope in the mail asking for a donation for a cause. Well, the trip down to Florida started last Tuesday as I boarded the plane in Birmingham heading to Atlanta and then on to West Palm Beach. Once we began to get in line to take off, the pilot announced that we would be delayed due to "low visibility" in Atlanta. So, we sat on the plane for about 40 minutes before getting clearance to take off. Once in Atlanta, I again boarded another Delta jet that would take me to my final destination. We were all situated in our seats, the safety information was given out by the stewardess...and, then the pilot made an announcement that we all needed to get off of the plane due to an engine problem. This particular plane would be out of service for several hours... and we were told to wait to see if there was another plane that we could board. Jeffrey, Janet and Celia were in Florida visiting my ex...but stopped by to spend a little time with me while I was down there. Celia just gets cuter and cuter every time that I see her. It was so wonderful watching my mom with her...she hadn't ever seen Celia and it was a real thrill to see her joy. Celia cooed and smiled just at the right times...it was such a great moment. If you notice that we are all bundled up in the picture two posts ago. A cold front came through Florida while I was there and it was freezing! No one expected it this time of the year....when the temps usually hover around 80 and, instead were in the 40's. ...to describe the last few days. It was an absolutely incredible experience walking with my sisters in the Susan G. Komen Race for the Cure for breast cancer. Maybe after a good night's sleep tonight I can post about this emotional experience down in Florida this week. While it is good to be back home, I have many feelings to express...More tomorrow.